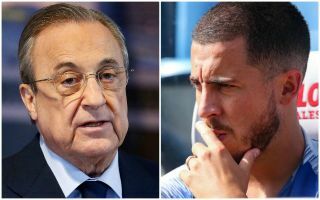 Chelsea star Eden Hazard has reportedly been in touch with Real Madrid president Florentino Perez with a major transfer update ahead of the summer. The Belgium international has long been linked with a move to the Bernabeu and he’s now informed Perez that he is desperate to get away from Stamford Bridge, wanting a deal done to take him to Spain as soon as possible, according to Don Balon. The report goes on to explain Hazard’s poor relationship with Blues manager Maurizio Sarri and how recent poor results have affected the former Lille man’s thinking regarding his future. Hazard will be in the final year of his Chelsea contract next season, so the pressure now looks to be on the west Londoners to let him go this summer if they want to avoid losing him on a free. And if Don Balon’s latest report is correct, the 28-year-old is putting real pressure on his current employers by courting Real Madrid so strongly. CFC fans will not be at all happy to hear this after their disappointing season, and after also losing Thibaut Courtois to Los Blancos last summer.